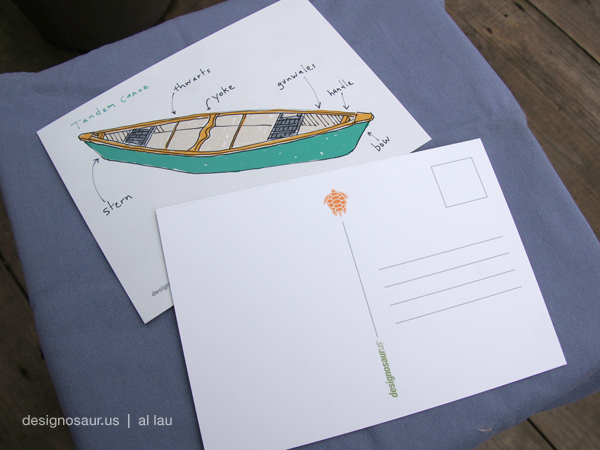 The Canoe is one of the oldest boat designs that dates back to 8000 BC, found in the Netherlands. The earliest canoes were made out of dugout wood or wood framing, then in the mid-20th century, aluminum became a more durable material to use. Nowadays, canoes are made of lighter materials such as fiberglass, royalex and kevlar, making them more car-toppable. Canoes are best used in rivers, lakes and calm bays. 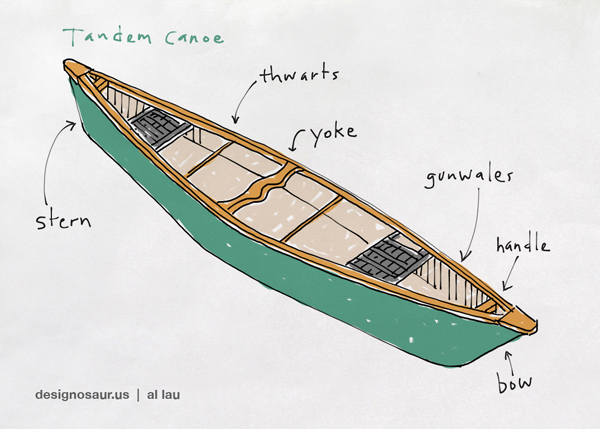 My third drawing is the tandem canoe. 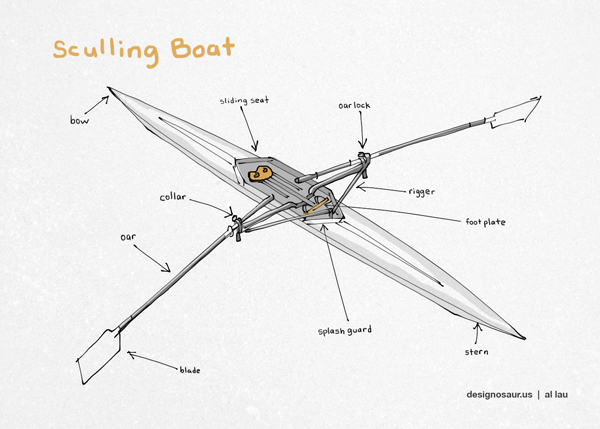 It is part of a 3-set recreational boat series. 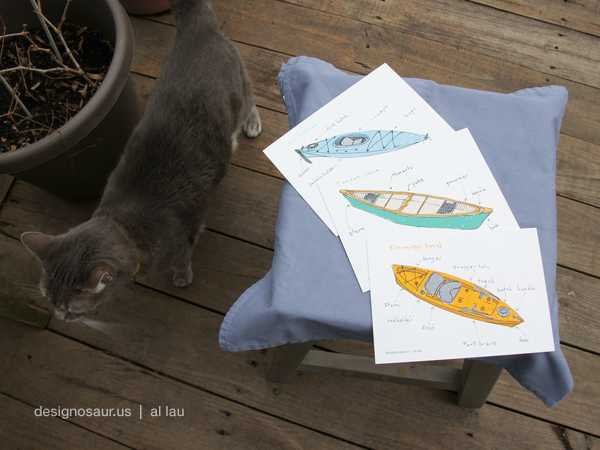 I created these as a group of postcards, available in my store. This is the backside of the postcard. It’s important to know where the stamp goes, right? My cat wanted to partake in the photoshoot. 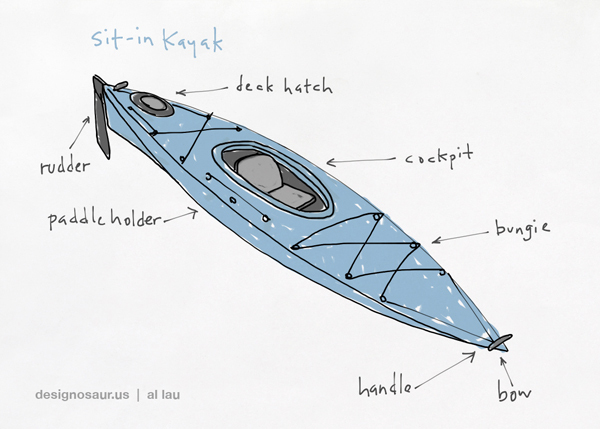 Today, my drawing is a Sit-On-Top Kayak. It is inspired by a model made by Wilderness Systems. The sit-on-top kayak is an alternative to the enclosed kind. The advantage of the sit-on-top is that it is self-bailing. If water gets into the hull, water simply exits through the scupper holes. This is especially useful when kayaking the surf where waves can get over two feet high. I am getting cabin fever with this rather cold winter. Anxious for the warmer weather of spring, I am doing a series of outdoor activity-inspired drawings with my Wacom tablet. 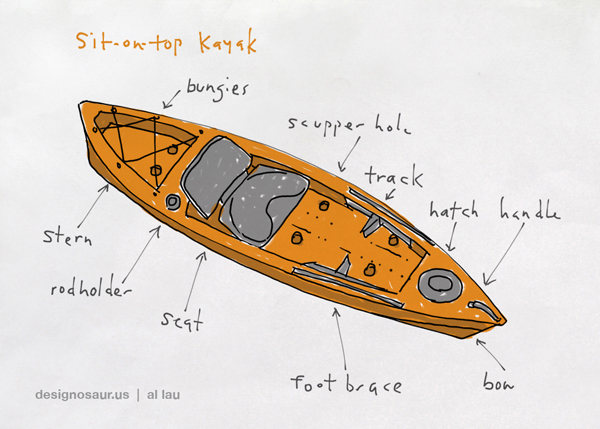 This one is of a sit-in kayak, labeling all the parts that make it characteristically a sit-in vessel.